Most answers to this question say that for instance Arabic text should be aligned right-to-left even if the rest of the page is in a left-to-right script such as English. 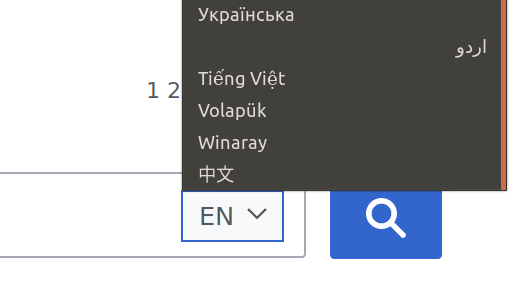 Both Wikipedia and Ubuntu are very international and are driven by very vocal communities so I don't think this choice is random. My question: Is there something special about language selectors that makes it OK to have alignment ignore language direction? Simple lists need not be like paragraphs. Not only would that look wrong, but it would be hard to scan. Sure, you’d think it’s weird, since most of the languages on the list are LTR, but it wouldn’t look wrong, and it would still be easy to scan. What we can learn from this is that natural alignment isn’t as important in situations such as these. For such a list, it makes more sense to maintain the alignment of its surrounding interface. However, once we get to longer phrases and sentences (especially anything that spans more than one line), it becomes much more important to display a language with its natural alignment. Just as it would be annoying to read long sentences in English when they’re right-aligned, left-aligned Hebrew and Arabic are also annoying to read. That said, all this is about alignment. It’s important to be aware that direction should always follow its language. Otherwise, punctuation shows up in the wrong place. Not the answer you're looking for? Browse other questions tagged lists selection alignment rtl writing-direction or ask your own question. How to deal with multi directional footnote language? How to handle selection when filtering a list?